If you plan on dressing up as a zombie killer for Halloween, this barb wire baseball bat is an excellent weapon of choice. 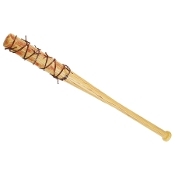 The baseball bat prop is made from molded plastic and painted to resemble wood, and has fake rusty barbed wire wrapped around the end. The evidence of previous bloody zombie fights is splattered on the end of the bat. Now you that you are prepared, let the apocalypse begin!